In the video below, Thomas Clough Daffern B.A. (Hons) D.Sc. (Hon) PGCE Ph.D., director of the UK-based International Institute of Peace Studies and Global Philosophy, talks about the need for a peace policy to resolve the war in Syria. Dr Thomas Daffern, Director of the Centre for Peace Policy Research calls for the urgent necessity for an agreed peace policy in Syria. The Centre for Peace Policy Research is a new project of the International Institute of Peace Studies and Global Philosophy launched in 2009. This work consolidates and extends the sustained interested shown by IIPSGP in formulating, articulating and advocating a rational peace policy for the UK, Europe and globally. The enormous costs of not having thought through a serious peace policy has become all too apparent in recent years. 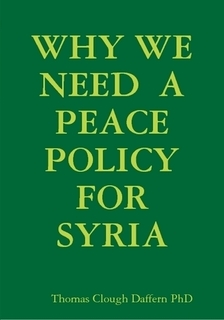 '"WHY WE NEED A PEACE POLICY FOR SYRIA" is a pioneering and unique work attempting to define a new field of international diplomacy, called "Peace Policy". It seeks to apply the ideas behind this new field of practical diplomacy to the test case of the civil war raging inside Syria, one of the most ancient countries on the planet. The book gives practical as well as theoretical suggestions as to how we can end the stalemate inside Syria and advocates some practical steps that can be taken immediately. "What I'm calling for is a ceasefire, a unilateral, universal ceasefire in Syria by all parties. But it's a mental or spiritual ceasefire I'm calling for first. We're not going to get the guns put down until the minds are changed, until the hearts are changed. What I'm talking about in this brief little presentation is the metaphysical and psychological preconditions for a physical ceasefire. Let politicians and military people work out that. I'm calling for everyone with a conscience, and with a functioning mind and heart, and brain, to work on that mental ceasefire." - Dr. Thomas Daffern [18:40 - 19:20].